Well MMO lovers, especially those loveable World of Warcraft players, your wait is just about up. 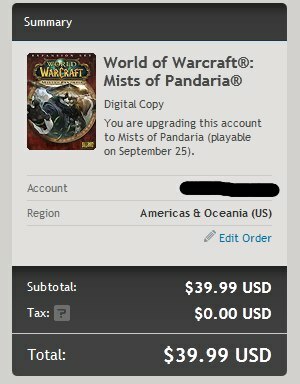 Blizzard has silently released info on when the upcoming expansion, Mists of Pandaria and that info states that September 25th will be the day. What, you want proof? You got it. Let’s examine this info, shall we. 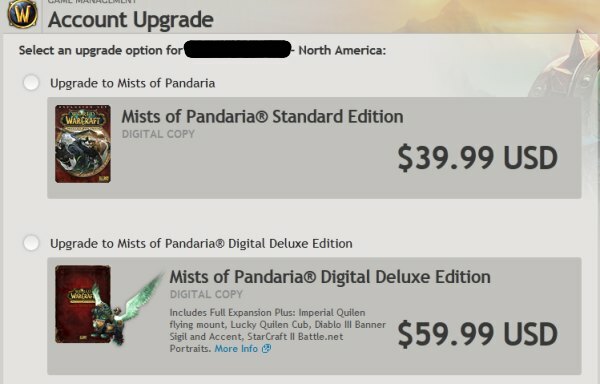 First up is taking orders for both the Mists of Pandaria Standard Edition ($39.99) and the Mists of Pandaria Digital Deluxe Edition ($59.99) via Battle.net. Also looks during the course of me writing this upBlizzard has announced it officially in the European markets, likely due to everyone figuring out that the 25th was the actual date. You can see this on their official EU press release – here. So there you have it! September 25th! Better make sure you put in your vacation time if you plan on hitting that server 1st… if you’re into that sort of thing. Me? Oh no way, I got a family and other stuff to do… Hehehe!